Not content to stay away for long, bass slinger Ed Russell aka Tessela steps up for R&S once again with what could be his hardest hitting sides yet. ‘Rough 2’ is built around a big, clattering drum pattern that’d perk up ears all on its own, which Russell layers with an edgy synth line and ray gun FX. He keeps the impossible hard drums hitting on ‘Butchwax’, which makes great use of beatbox-like samples. 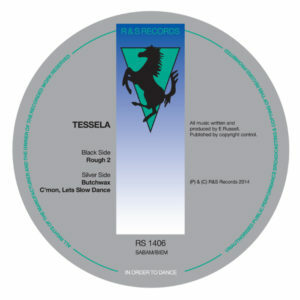 Closer ‘Cmon Let’s Slow Dance’ is another percussive feast that showcases Tessela’s insane, unparalleled programming.